My local fast food restaurant just announced they will no longer be supplying disposable plastic straws with my serving of amazing Root Beer. We knew this was coming as it’s all over the press but now it has hit close to home. Those flimsy cups just don’t work for drinking from the rim so it is time for a new addition to my Everyday Carry Cutlery. It looks like reusable and cleanable stainless steel straws are the way to go. 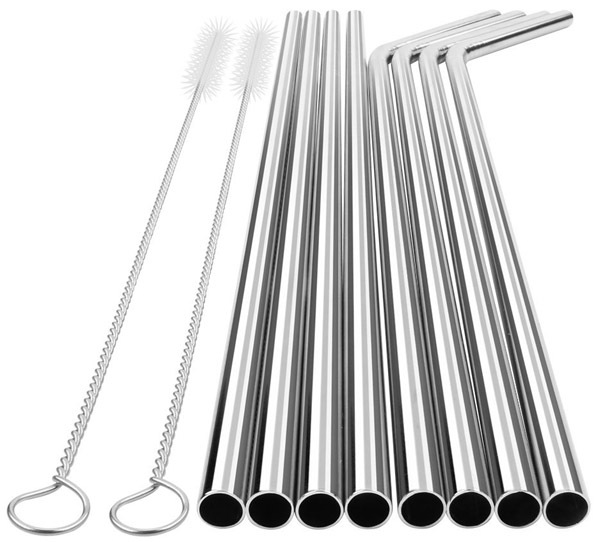 The YIHONG stainless steel straws set of 8 has 4 bent, 4 straight and 2 cleaning brushes (as seen above). They are 10.5 inches long and made of plastic free, BPA free, dishwasher safe food-grade 18/8 stainless steel. They claim no metal aftertaste and are rust free and scratch proof. I would recommend giving them a good soapy scrub before using the first time. Sometimes metal products like this have a small amount of machine oil on them from manufacturing.